Every once in a while a film comes along which defies the ideology of a sequel. It's a sequel's job to try and be as good as the first, but we all know the inevitability of the pitfalls of this ambition. 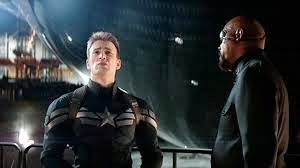 Captain America: The Winter Soldier is a particular rarity as it is not only a sequel which measures up to the first, but is in many ways better than the first. It has all the excitement of the modern day Marvel hero, but an added historical backstory that gives it a point of difference. There is plenty of action and a well written screenplay brought to life by convincing performances by it's impressive cast. Steve Rogers AKA Captain America (Chris Evans) is starting to adapt to life in the present day, but still keeps one eye in a past which is hard to forget. 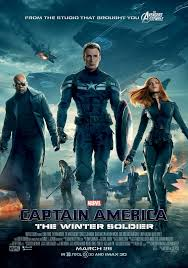 When SHIELD is compromised, Rogers finds Nick Fury (Samuel L. Jackson) in his apartment after he has been attacked by a mysterious enemy, who Natasha Romanoff (Scarlett Johansson) believes to be the Winter Soldier. The Winter Soldier is a ghost-like force who has been appearing in attacks since the war and has superhuman strength, much like Rogers himself. Rogers finds that he has to once again don Captain America's suit and armour and save humankind from a greater evil. Captain America: The First Avenger and Captain America: The Winter Soldier are really two very different films. This goes without saying really as one is set in the 1940's while the other is set in present day and this means that they have two completely different atmospheres. Captain America: The First Avenger was very much a historical film and very nostalgic. It played on the reception of the 1940's superhero in society and it's nostalgia for this hero came across at times as slightly comical rather than patriotic. The newer film has a completely different feel to it. It has the historical aspect which is seen through darker lenses than it's processor, but it is also very much a present day Marvel film. Captain America: The Winter Soldier also borders on being a political thriller with the inclusion of Alexander Pierce (Robert Redford). It is a different superhero film than we are used to seeing as a result of a wonderfully written screenplay by Christopher Markus and Stephen McFeely. With the inclusion of new characters in a sequel, it is often a challenge not to make the film seem too busy and have too much going on at once, but Captain America: The Winter Soldier flows perfectly and everything and everyone included as crucial to the film as a whole. The dialogue is also very good. One of the problems of the first film was that the dialogue was very cheesy, yet not so in this film. The large majority of it is very natural and when funny, not forcefully funny or over the top. One of the reasons one goes to see a Marvel superhero film is to watch something action packed. There is absolutely no lack of action here. The film explodes into it's first action scene within the first few minutes, and although some of the camera shots are very shaky and fast paced, they are very entertaining and extremely well choreographed. Directors, Anthony and Joe Russo relied on minimal CGI in the film so to make everything look substantially more realistic, and it absolutely does. Chris Evans is very, very good as Steve Rogers/Captain America. As this is his third film in the role, it is obvious that he is now so comfortable in the role and has really settled into the character. He is so natural in his dialogue and exceptionally likable. Scarlett Johansson here has her second outing as Natasha Romanoff/ The Black Widow and she is another who has really settled into her role. She has the right charm for the character and although she is clearly a stunning woman, it is great to see a female action character not mention a thing about her physical appearance and rather just rely on her ability. She is also incredibly likeable and has some moments of wonderful acting. Her and Evans work very well together and have a wonderful platonic chemistry on screen. Another refreshing thing about this film is that there is no romantic chemistry between the lead male and female characters. Of course if you have seen Captain America: The First Avenger and The Avengers, you will know that Rogers' heart belongs to Peggy Carter (Hayley Atwell) and Romanoff's to Clint Barton/ Hawkeye (Jeremy Renner), but is still nice to see a film which doesn't fall into stereotypical conventions. Samuel L. Jackson is Nick Fury and there is no way around it. He is always a terrific character on screen. Anthony Mackie is a wonderful addition to the Marvel superhero family as Sam Wilson/ Falcon. He is fun, lively and full of character. Robert Redford also does well in his role and is a particularly interesting character. Emily VanCamp's Kate/ Agent 13 doesn't have a great deal to do in the film and it would have been nice for her character to have a bit more of a role in the film as there was potential to do so. 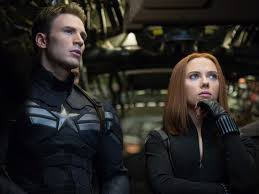 Captain America: The Winter Soldier is completely different to it's processor and even if you didn't like the first film, there is a good chance you will prefer and enjoy the second film a great deal more.